Celebrate the holidays while preserving the environment, too! 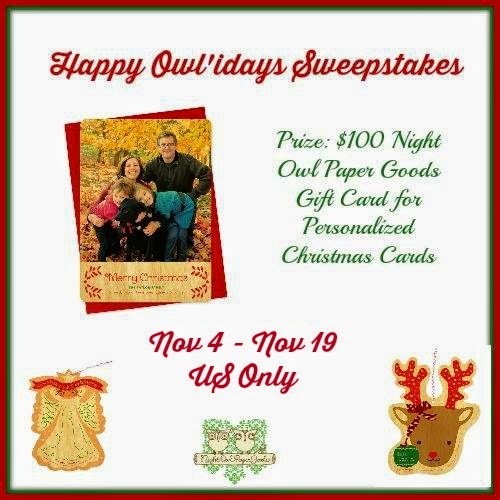 You have a chance at a $100 gift card to use for personalized Christmas cards at Night Owl Paper Goods. You're guaranteed to fall in love with this great company and their amazing products. Enter below, good luck! Do you love sending out personalized holiday cards? Nothing is more fun than getting a unique Christmas card or cute cards with a picture of your entire family. Not only are they great at wishing your family and friends a happy holiday, but they provide updates on how everyone on the family is doing. The problem, however, is finding fun, unique holiday cards. This is one reason why we love Night Owl Paper Goods! They make fun, folk themed Christmas cards that are adorable, cute, unique, and best of all, on actual wood! As well, their personalized cards can say or look however you want, making Christmas even more fun -you can even have wooden ornament cards! To learn more, make sure to check out Budget Earth's Personalized Christmas Cards article. Want the chance to make your own personalized Night Owl Christmas Cards? We are excited to be working with Night Owl Paper Goods on this fantastic giveaway! One very lucky reader will win a $100 Night Owl Paper Goods Gift Card for making their own personalized gift card (or anything else they want to purchase from their store!). To learn more, make sure to read the rules below and then enter through the Rafflecopter! We are doing our Christmas photos today and I'll definitely need personalized cards to send out. Thank you for this!